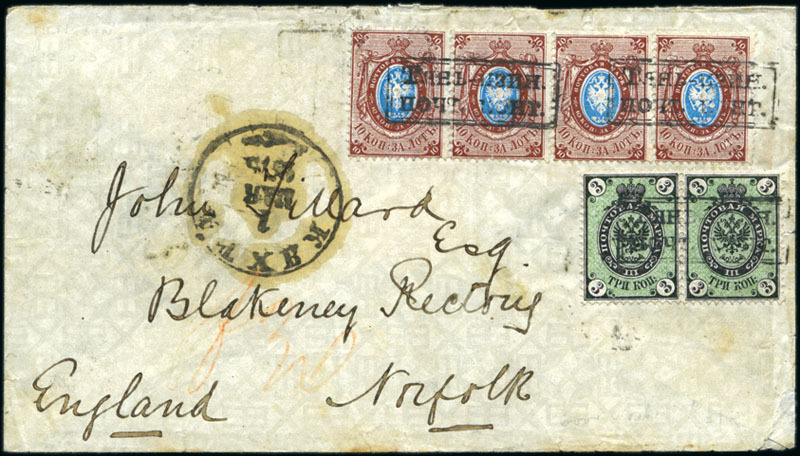 TIENTSIN: 1875 Cover to Dereham, England, franked with 1866-75 10k strip of four and 3k pair, tied by three clear strikes of dateless double-framed “TYAN-TSZIN. POCHT. KONT.” (Tientsin Post Office) hs, with Kyakhta transit adjacent dated 1 May 1875, the letter having left Tientsin about two weeks earlier, showing Moscow transit and Dereham arrival bs. 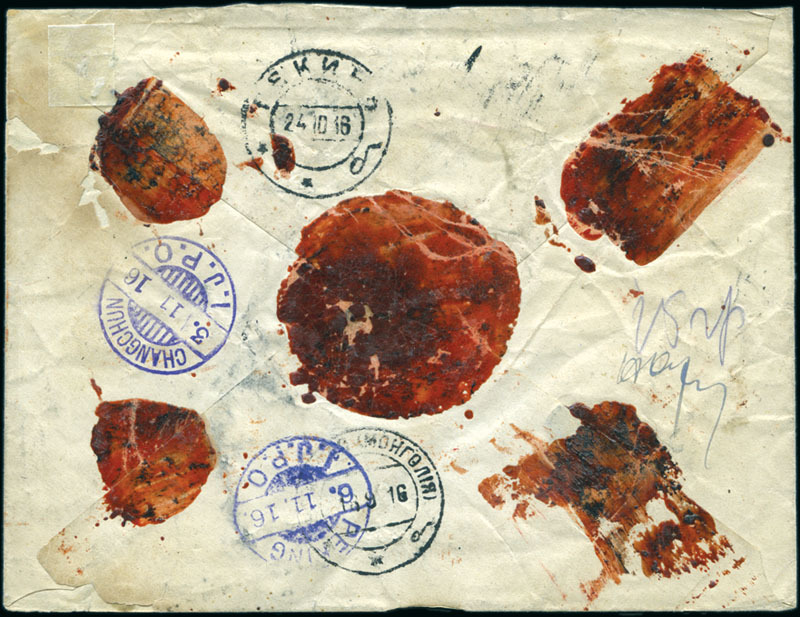 Postage of 46k represents pre-UPU rates of 30k for conveyance to the Russian border at Kyakhta and 16k for onward transmission from Russia to England. 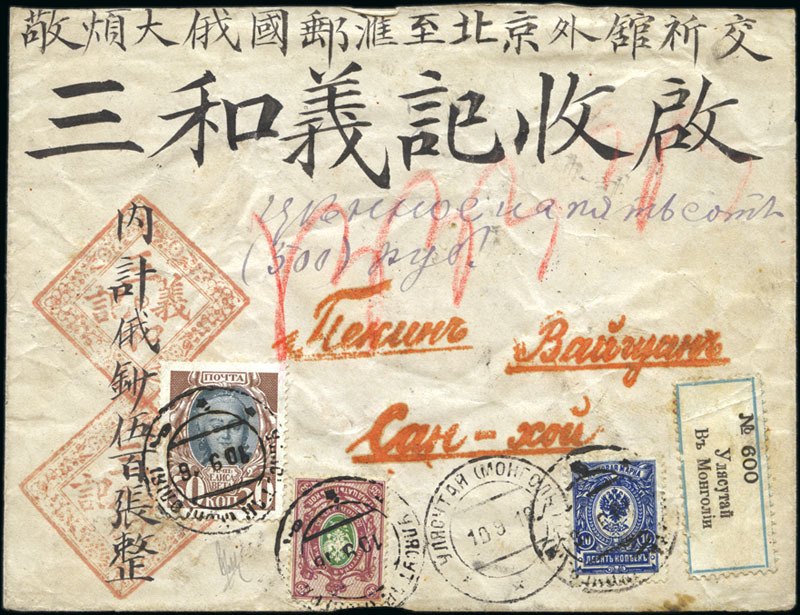 Earliest known mail from the official Russian Postal Administration in China, using Russian canceller on Russian stamps, and only known use of Tientsin’s first Russian handstamped canceller on cover. The Jewel in the crown of the Russian post in China Note: Illustrated in the BJRP nos.18 (1955) and 71 (1991) and “The London Philatelist” Nos. 1151-52 (1988)- The “Kyakta Type 2” of Tchilingirian & Stephen, “Stamps of the Russian Empire used Abroad” pt. 4 (1959), 9.312, said to be based on the cancellation on this cover, is a fantasy, showing posthorns at foot instead of the fleuron depicted herin. David Feldman – Spring Auction 2012The auction consists of 3 specialised catalogues:Belgium: The spectacular Anatoly Karpov collection, part II with more than 900 new lots of Belgium and Belgian Congo.Russian Post in the Chinese Empire: First part of the collection Grand Prix formed by Dr. Raymond Casey (Offices in China Proper, Offices in Mongolia & Sinkiang)Greece Large Hermes Heads Collection plus an important assembly of 19th & 20th proofs. Belgium: The spectacular Anatoly Karpov collection, part II with more than 900 new lots of Belgium and Belgian Congo. Greece Large Hermes Heads Collection plus an important assembly of 19th & 20th proofs.